I had awesome seats, fifth row Ronnies side against the catwalk. Hope Estate is an amazing venue for concerts and after the Sydney show I was looking to more than ever. 2. Let's Spend The Night Together - Lovely version, nice back up vocals from Keith. 4. Tumbling Dice - It got the crowd going. Jagger was working the crowd quite hard. In the front section everybody was really into it but I got the impression that the rest of the crowd weren't too loud. 6. Rocks Off - Great surprise and great version. Strong and loud intro by Keith. Jagger seemed a bit lost half way through but very good version none the less. 7. Paint It Black - Great crowd pleaser!!!! Keep it in the set! 8. Honky Tonk Women - Really enjoying this live because it such a great sing a long. -- Band Introductions -- When it was time to introduce Chuck he looked over to him twice to, jokingly, double check if it was his turn as he forgot to introduce him in Sydney. 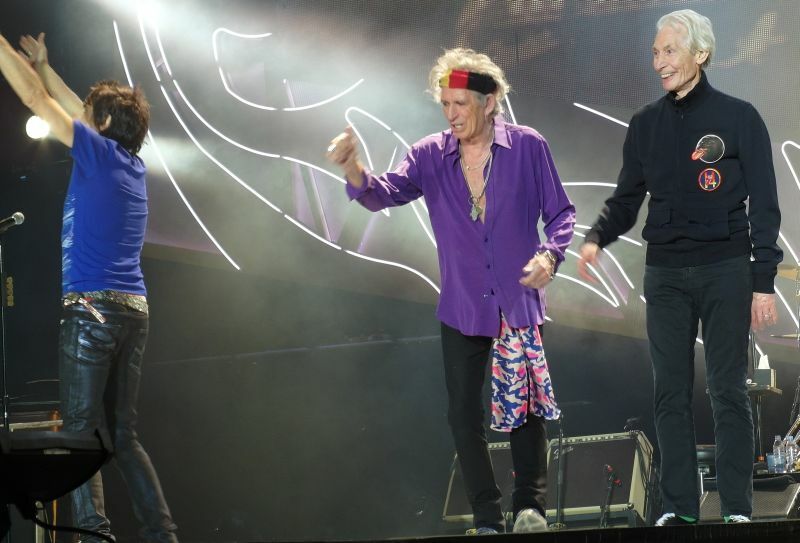 He introduced Charlie as Charlie "retiring" Watts!!!! Unusual to say the least. 10. Before They Make Me Run (Keith) - They are really nailing this one!!!! 11. Can't Be Seen (Keith) - Strong version compared to the resent messy ones. 12. 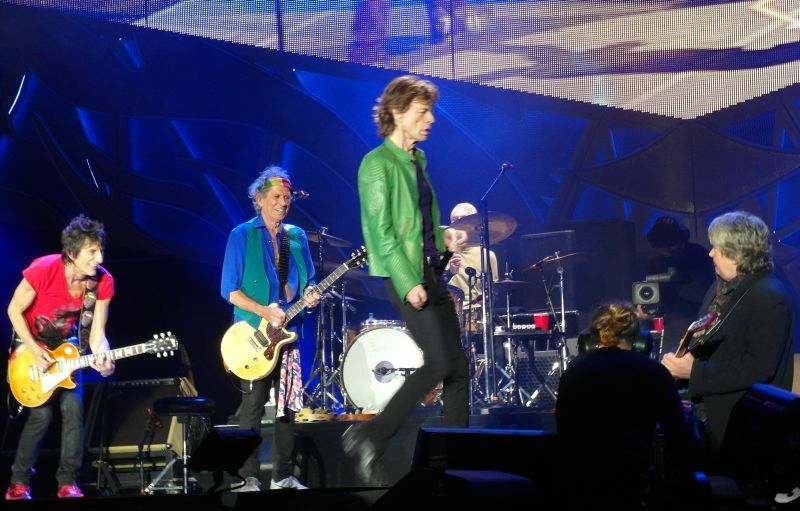 Midnight Rambler (with Mick Taylor) - Awesome as always. It felt like it was a bit shorter than usual. Keith "rushed" the changes in the song. 13. Miss You - Great crowd response and Darryl Jones had an amazing bass solo! Tim Ries' sax solo is great but it's a bit too Jazzy for me, compared with Bobby Keys' more rock 'n roll sax solo. 14. 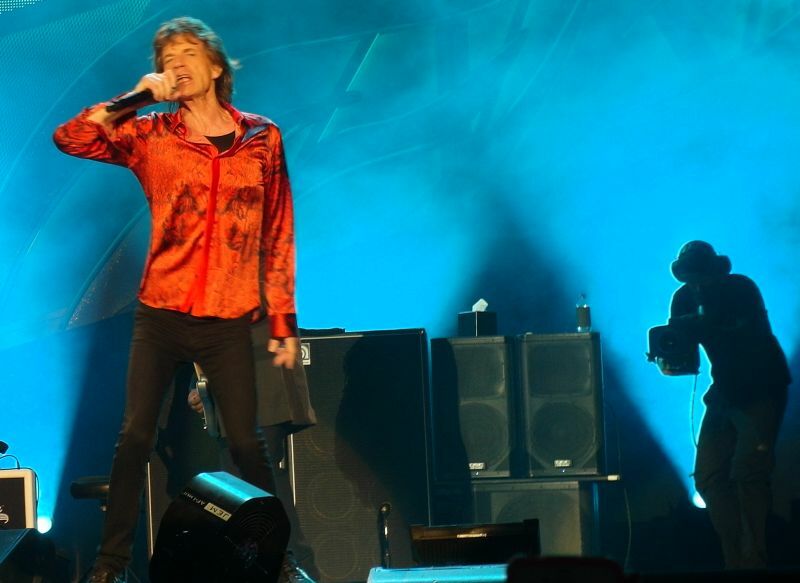 Gimme Shelter - This was truly a crowd favourite. Keith had a pretty good solo and Lisa waiting a bit too long before she started her solo but when she did, she blew everybody away. 15. Start Me Up - Nice and tight again. It sounded nice and fresh. 16. Sympathy For The Devil - Like the Sydney show, IMHO it didn't live up to it's live reputations as a big showcase. 18. You Can't Always Get What You Want (with the Sydney Philharmonia) - Awesome, Great solo by Ronnie and Chuck re-started the song after it finished with some boogie woogie piano playing and the whole band kicked in. I love some impromptu jamming!!!! 19. (I Can't Get No) Satisfaction (with Mick Taylor) - Great crowd pleaser again, everybody was dancing around. Great show again and as I was standing next to the catwalk I could hear the monitors turn on high volume every time Keith or Ronnie walked to the front of the stage or on the catwalk. Could be because of where I was standing but it sounded like the drums were way up in the mix of the catwalk monitors. 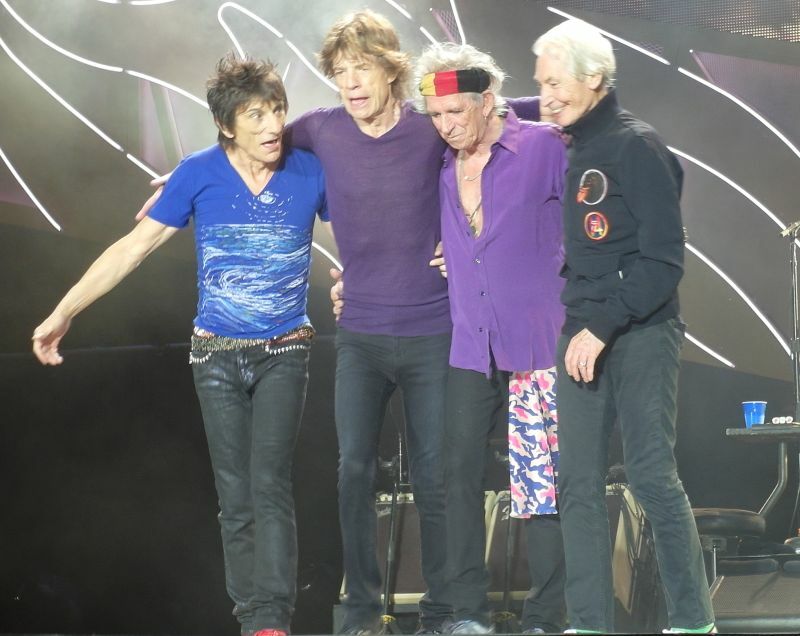 Great show and let's hope that Mick's introduction of Charlie "retiring" Watts was a joke because as they are playing now they should go on for a bit longer! 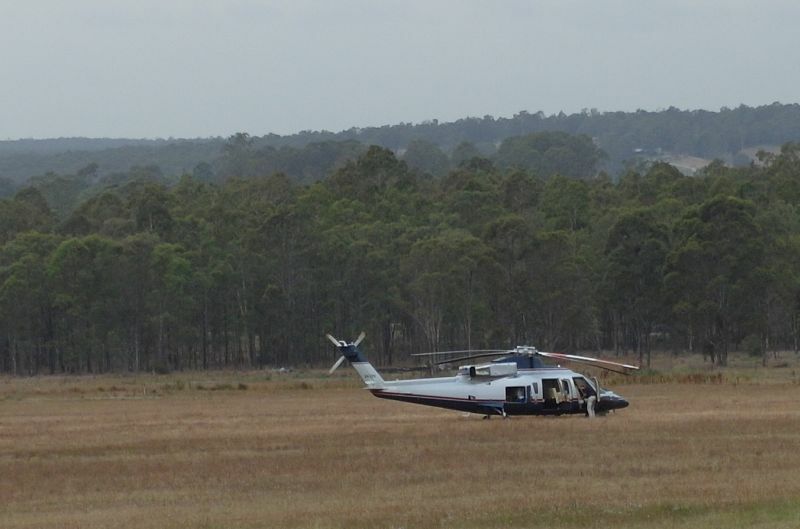 It took close to three hours to drive from Sydney downtown to Hunter Valley. I was lucky to have a place to stay just 5 km away from the venue Hope Estates. On the day of the show I managed to bike around in the area and see all the wine yards and taste som Hunter Valley wines. This place is unique, and it was a great backdrop for the show tonight. As we leave the bus that took us the ten minutes drive to the venue, we see the merchandise tents. Great Hunter Valley T-shirt inspired by the grapes and the wine industry here! The warmup bands finished early. This made me feel the 8:15pm show start time might be incorrect. Some times they start before the given time. With a long travel back to Sydney after the show, I assume they want an early start. By 8pm sharp the lights go out, it is dark. 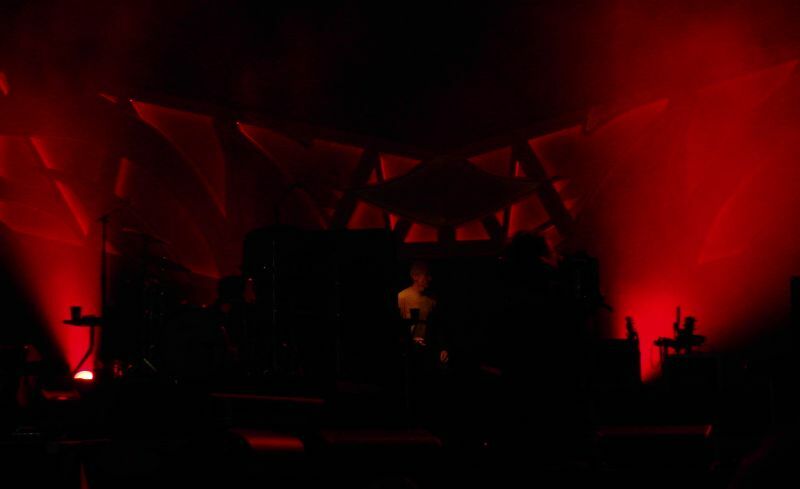 The smoke and the red colors on stage makes us all go wild. I can see Charlie up there on his drums. The show is on within seconds. Jumping Jack Flash. What a great start. The crowd is on, even if they are all seated up front. But nobody is sitting down in my area. Mick is sounding great, and I am so glad his voice is back. The B-stage is very close to the main stage, so he is up and down there on every song several times. Paint It Black! The lights go blue. Again a very popular song. Band presentation after Honky Tonk Women as song number eight. This means we will get three songs by Keith tonight, like in Sydney. 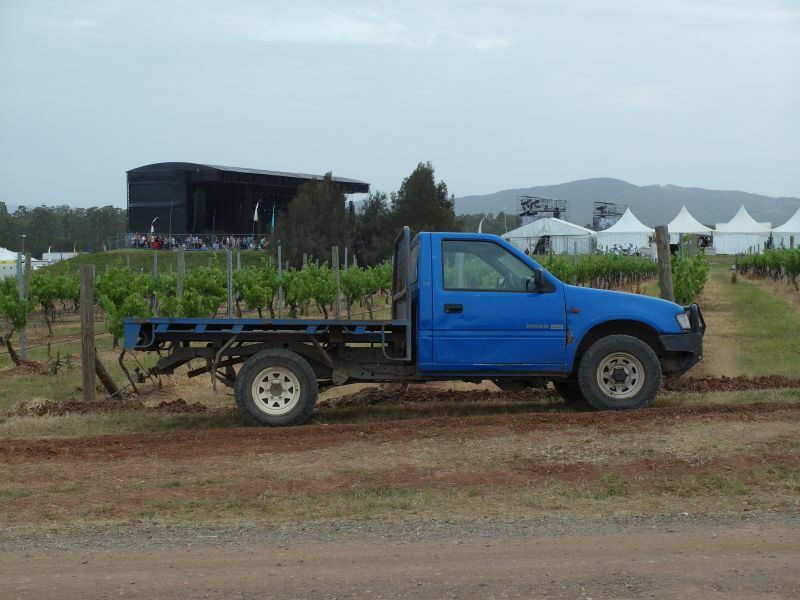 On daytime today Hunter Valley had more than +30 C degrees, i.e. 90 F or so, but during the afternoon the temperature dropped to 20 C i.e. 60 F or so before sunset. Charlie had an extra layer, and everybody had layers of jacket and sweater on stage. 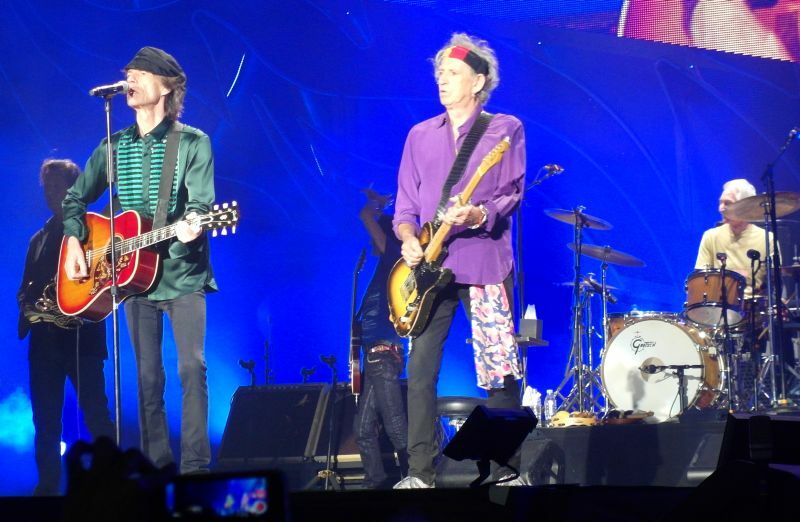 I could see both Mick and Keith having some goughing in Sydney, so it is time to beat the cold. Keith up front! He started his part with receiving the big ovation as usual. Then he said: "Where do you all come from?" I hear somebody is shouting out "Sydney!" Well it is good to be anywhere! Midnight Rambler still. Great version. 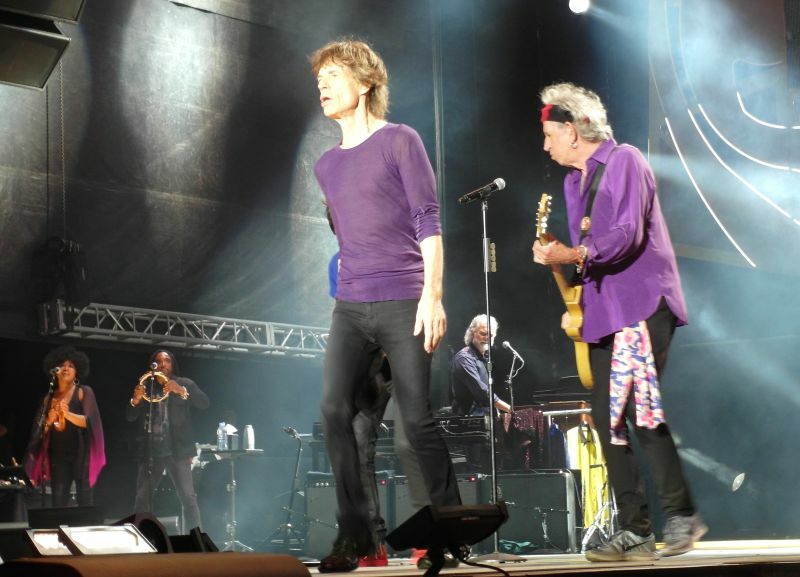 Mick Jagger has finished his second harmonica duel with Mick Taylor. Once more he is out on the B-stage in the crowd. Ronnie is finishing off Rambler with his excellent solo just at the end of the song. I love it! Ok. Rambler is not over yet. This is the final part. Mick is back in action and in charge of the show. 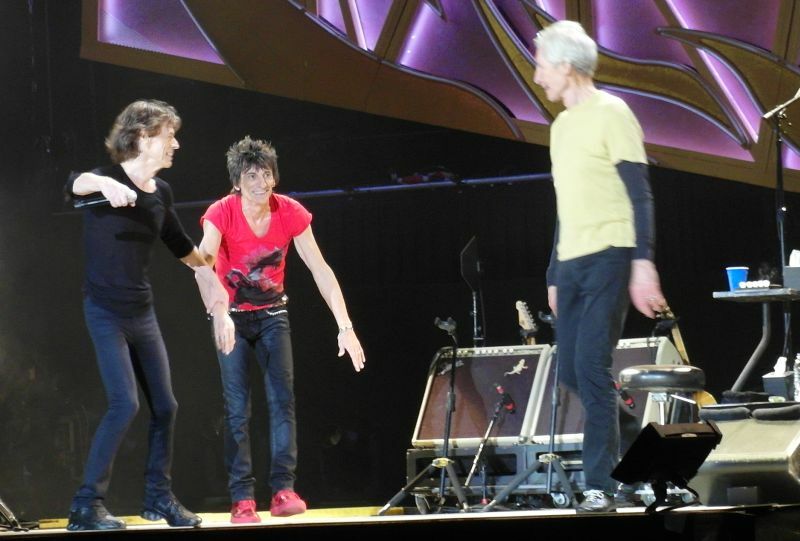 Everybody on stage is following Mick ... Jagger that is. You Can't Always Get What You Want. We are getting emotional. I know many friends are leaving the tour after this show. This has been a great show, a great tour, and all wories from Hanging Rock are now forgotte. 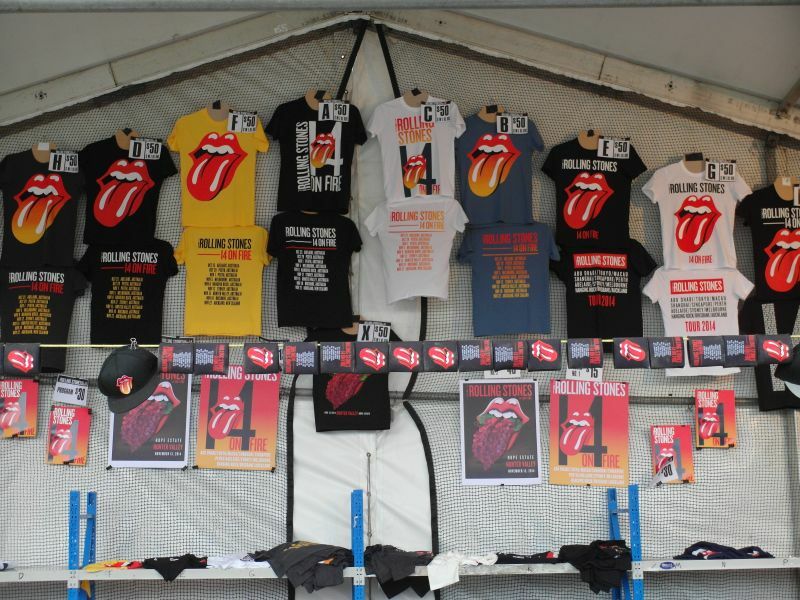 We want the Stones! Satisfaction. Great every time. So much fun on stage. 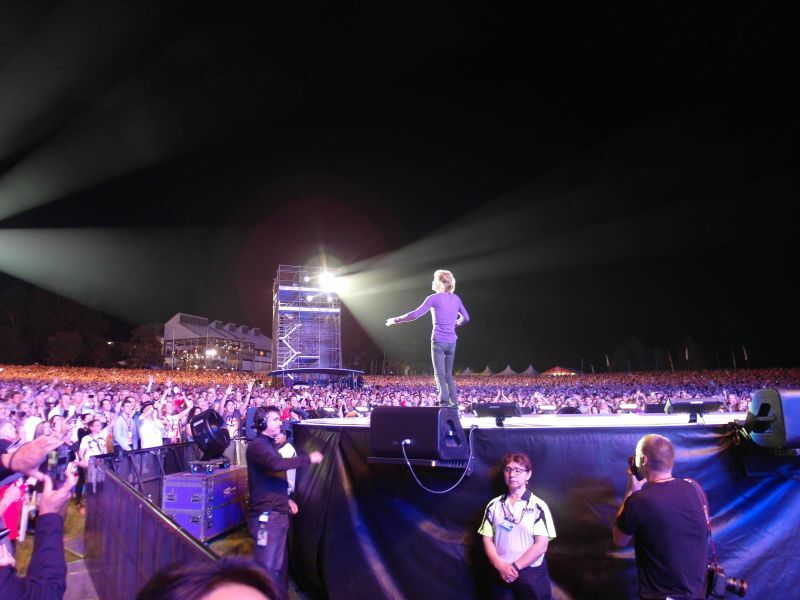 Mick Jagger is all over. Keith is playing his solo parts. 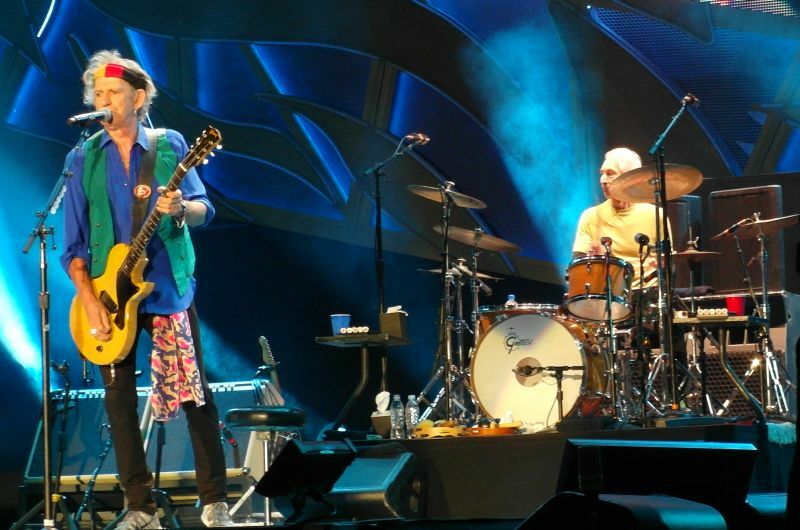 Right now he iw with Mick Taylor and is having a great time, like we al have at Hunter Valley! 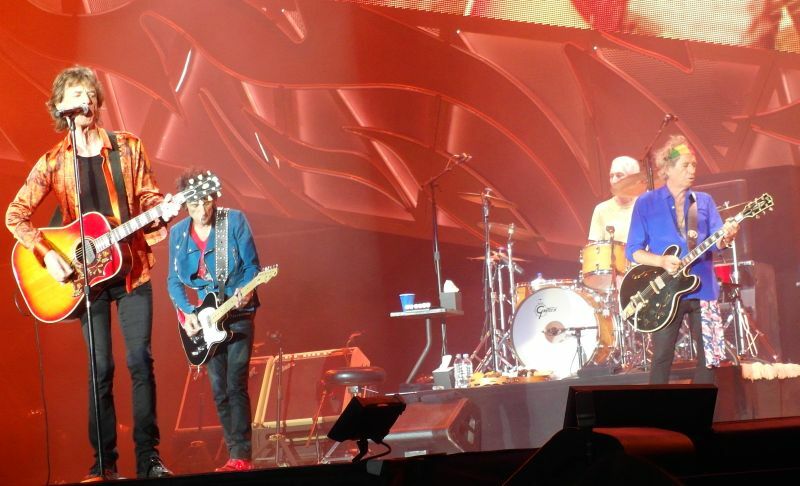 Mick and Keith together up front during Satisfaction. It is all over. Keith is on his knees up front. So happy with the crowd and the show. Charlie is about to throw his drumsticks out into the crowd. 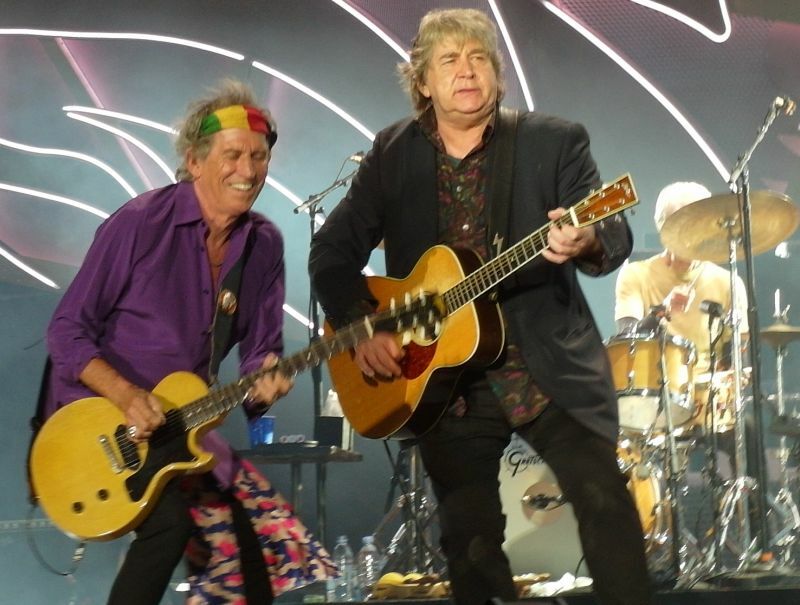 Mick Taylor is next to Charlie still hight from their performance of Satisfaction. 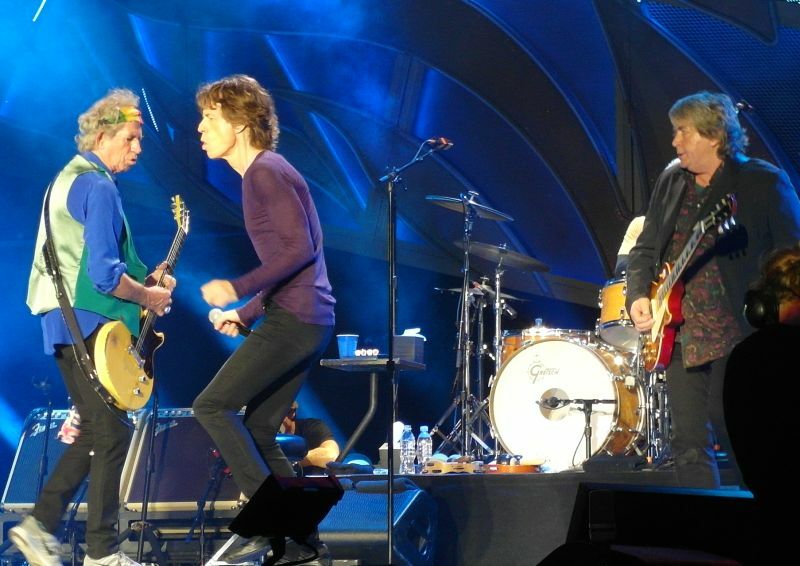 Don't tell me it is all a waste to have Mick Taylor on stage for Satisfaction. I do enjoy every moment of it. And so do the rest of the band. Two hours and five minutes of pure rock'n'roll. It is all over. You can read their faces. Everybody is smiling. On the bus back after the show I listen to the comments from others. What a great show. Some say "Gimme Shelter" with Lisa was the best song. Others say Keith was just great. Some are very young in their 20's, and they are now great fans. Everybody is happy. 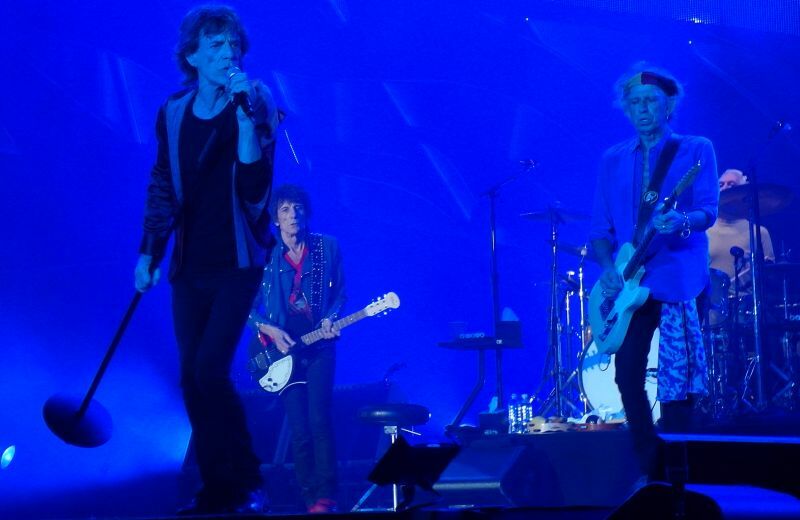 Thanks to the Stones for another great show! 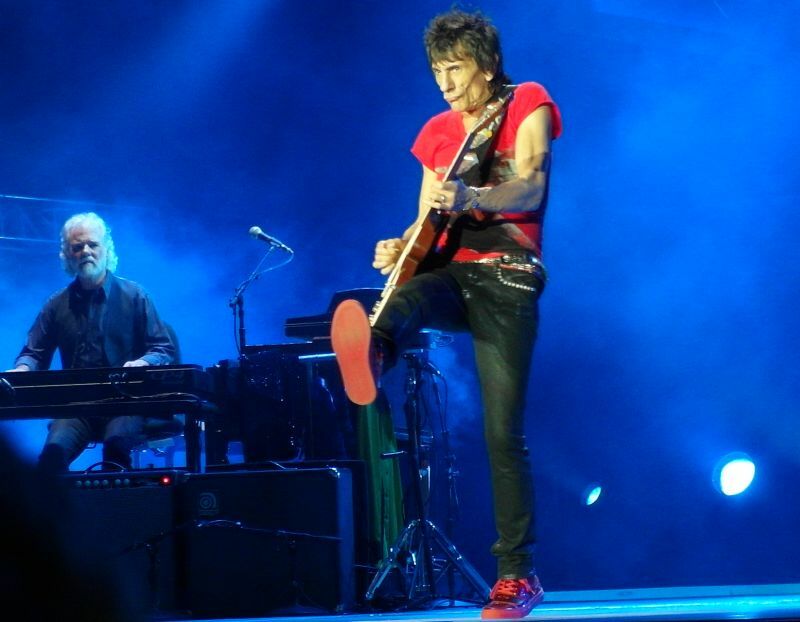 Ronnie, Mick, Keith, Charlie - thanks! 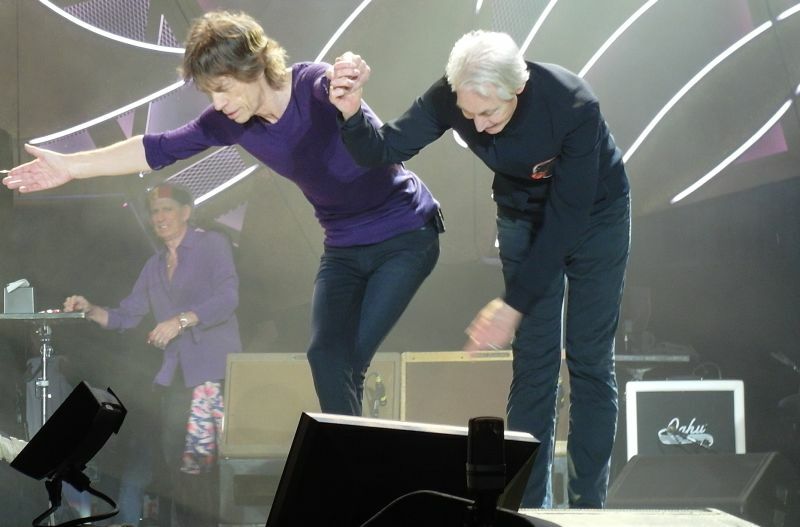 Mick grabbed Charlie for an extra final final bow tonight. They did not want to leave us early tonight. As we boarded the Sydney train at 4am, my wife(Yvonne) and I had 12.5 hours of comfortable travel time to reflect on many things. We were happy to be escaping the restrictions placed on Brisbane residents by the hosting of the G20 Leaders' Meeting but disappointed that our son Andrew (who lives in Melbourne) missed out on seeing our boys in March due to postponement and November because of Mick's throat. We had given him the choice of Rod Laver Arena or Hanging Rock and he chose the latter. That decision he took means that he almost certainly will be the only family member never to see the Stones perform on stage. After all, we had taken his sister to see the first of the Hyde Park shows in London last year. Both of them were indoctrinated with Rolling Stones music growing up. But, the other matter occupying our thoughts as the train sped through beautiful countryside with the occasional glimpse of ocean beach was that the show we were headed for in the Hunter Valley wine district of New South Wales state was likely to be our last. What kind of show was it going to be? Would it be as good as Melbourne? 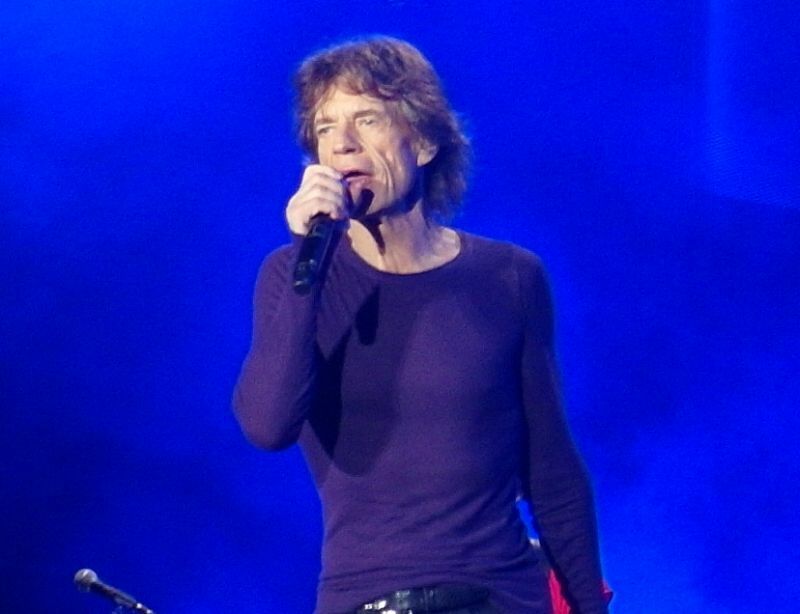 Would Mick's voice stand up to another two hours of rock vocalising? We need not have worried. We got off the train in the township of Maitland and headed straight for the venue to check out the preparations and the terrain for a bloke like me who was still using walking sticks after a serious car accident last May. There was feverish activity in building the stage and free wine tasting to wet the tonsils.....perhaps that was all Mick needed! The next day, the bus collected us from our accommodation. I was last on the bus and stood at the front saying, "Let me please introduce myself.....". That did it. The whole bus started choruses of "Woo.woo, Woo, woo" for almost the entire 25 minute journey. And the concert? 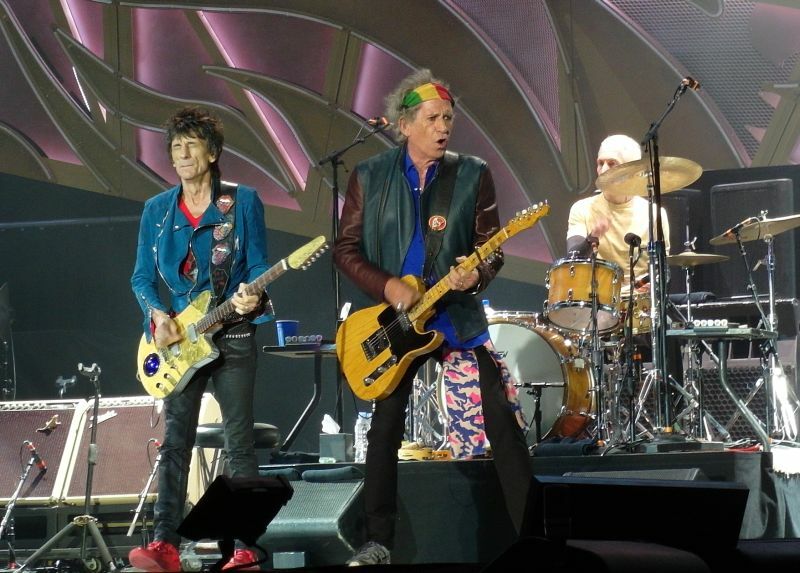 Great venue, cooler evening weather, enthusiastic crowd, terrific sound AND......the Stones in great form from the time Keef started the 'Jumping Jack Flash' riff. Nice surprises were 'Let's Spend The Night Together', 'Dead Flowers', 'Rocks Off' and 'Paint It Black'. 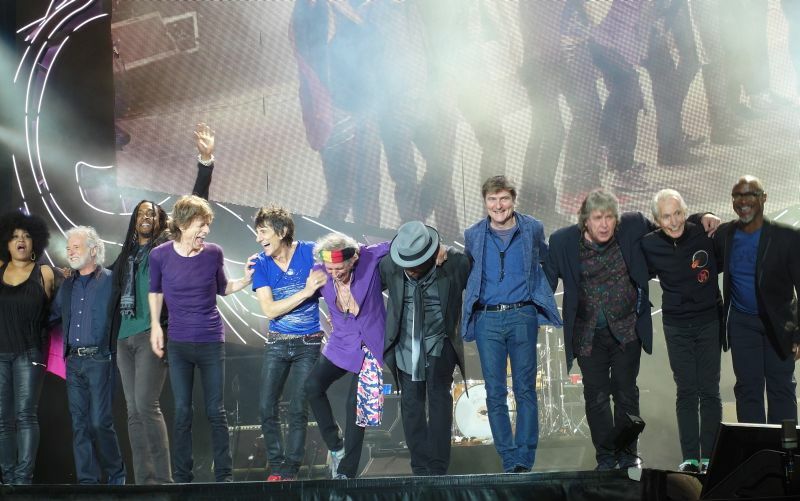 Mick referred to Charlie as "shy and retiring" and tried to encourage him to go right to the end of the extended stage to take a bow.The "shy and retiring" Mr Watts decided against it. 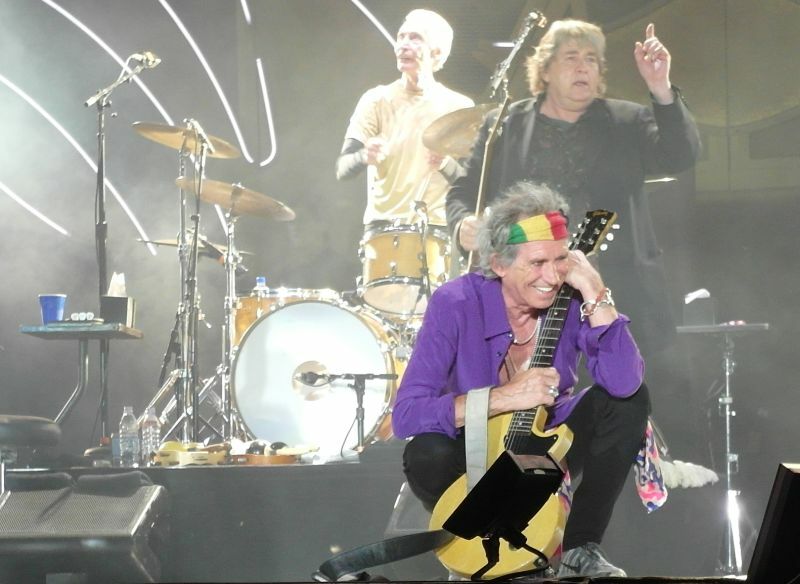 Three Keith songs is too many especially if he includes 'Can't Be Seen' which he has never really nailed on stage but all that was soon forgotten with 'Midnight Rambler' and probably the best lead guitar performance of Mick Taylor since he started playing with the Stones again. He actually got down on his knees to play and struggled to get up again.Thanks Mick,you were great. From there, the show continued with the expected menu, the wonderful operatic singing of Lisa Fischer on 'Gimme Shelter' and crowd sing-a-long favourites like 'Miss You', 'Start Me Up' and 'Brown Sugar'. Can you believe that there are still people who believe the show is over when the band says "Good Night, Hunter Valley" and leaves the stage?! Many of them quickly returned to their seats when the choir started up the familiar opening of 'YCAGWYW'. Another great crowd sing-a-long and enhanced this time by a Leavell-inspired jam at the very end. Then came, what else? A wonderful version of 'Satisfaction' and a nice fireworks display as our life-long obsession took their bows. We refuse to pay big money to see anybody at the Brisbane Entertainment Centre because of the poor acoustics so as we boarded the overnight sleeper train back to Brisbane, we knew that this was almost certainly the last time(cue song!) because it must be very doubtful that they would ever tour Australasia again. We dozed off to sleep remembering the original band and its blues origins with Ian 'Stu' Stewart, Bill Wyman and the late lamented founder Brian Jones. Remember the slogan, "no Jones, no Stones". Thanks to all of you for more than 50 years of wonderful music.